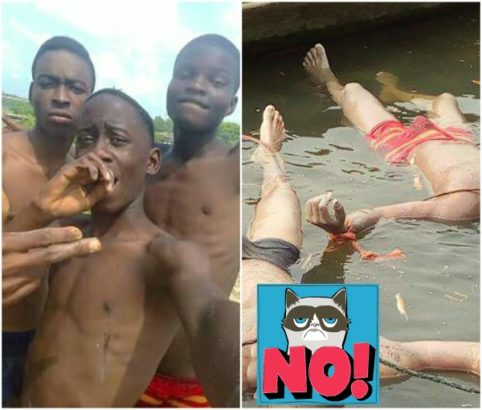 The bodies of two students of Alex Secondary School, identified as Aniekan Harry (left in blue) and Uche Okoli (right in red) have been recovered after they got drowned in the Qua Iboe River in Akwa Ibom State. The SS2 students who sneaked out of their school on Thursday December 7th with six other students to go play football, went against their colleagues advice of swimming in the river. It was gathered that after the students couldn’t be found in the River, marine police officers around the River were alerted and a two day search for the victims began and recovered yesterday, Saturday December 9th. Akwa Ibom Police command PRO, DSP Bala Elkana, who confirmed the incident said the body of the late students have been deposited in the morgue.